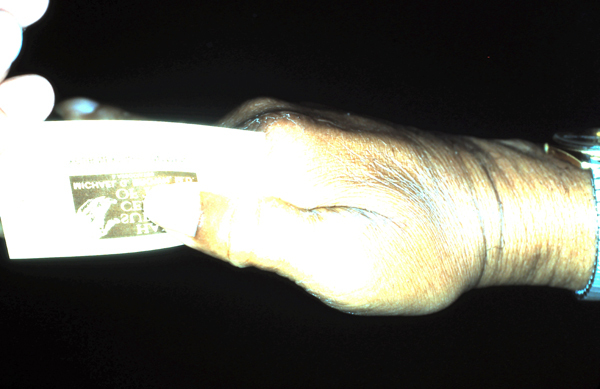 Extensor Indicis Proprius transfer to thumb to restore weak pinch secondary to ulnar neuropathy. 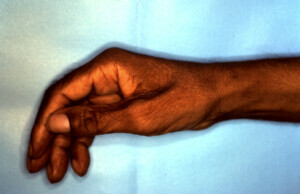 Low ulnar nerve palsy or a lesion of the ulnar nerve at or near wrist or base of palm will result in paralysis of the majority of intrinsic muscles of the hand including the hypothenar muscles, all interosseous muscles, 1/2 of the flexor pollicis brevis, 3rd and 4th lumbrical, palmaris, brevis and the adductor pollicis. 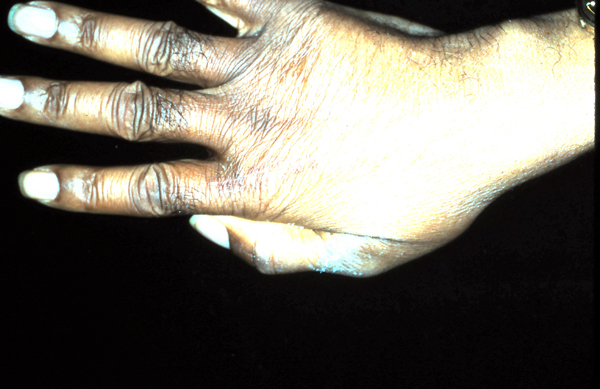 This causes multiple functional deficits. One of these functions is adduction of the thumb which is essential for lateral pinch. Ulnar nerve weakness of intrinsic muscles with atrophy of first dorsal interosseous and adductor pollicis resulting in weak lateral pinch. Visible atrophy of 1st dorsal interosseous. Thumb IP flexion to compensate for weak adductor. 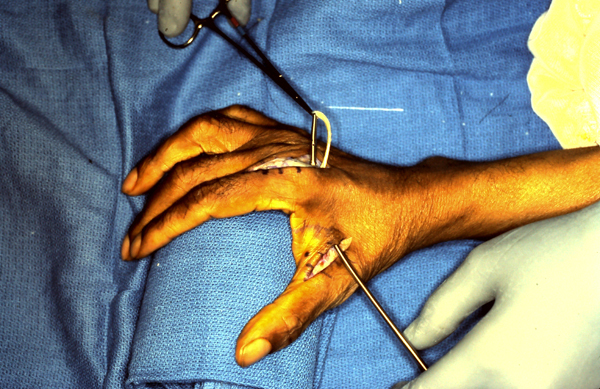 Tendon passing forceps ready to transfer EIP tendon between 2nd and 3rd metacarpal and volar to 2nd metacarpal to mimic the natural direction of pull of the weakened adductor. 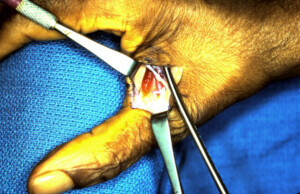 EIP harvested from index finger being rerouted to thumb MP joint. 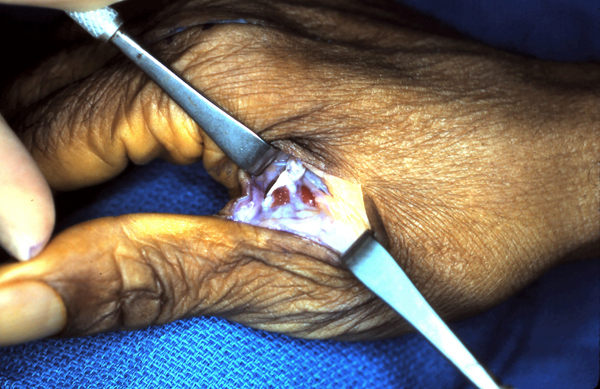 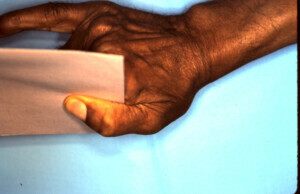 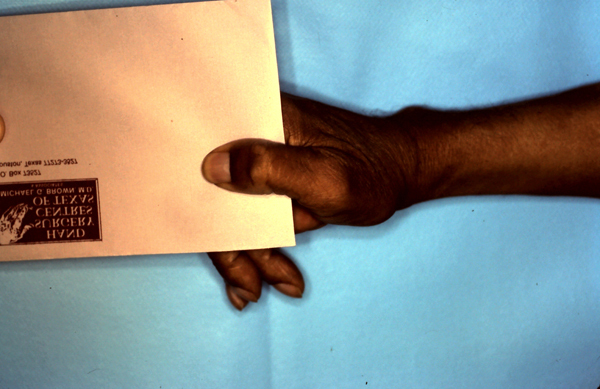 Tendon being passed volar to second metacarpal and to the area of insertion of the adductor pollicis. 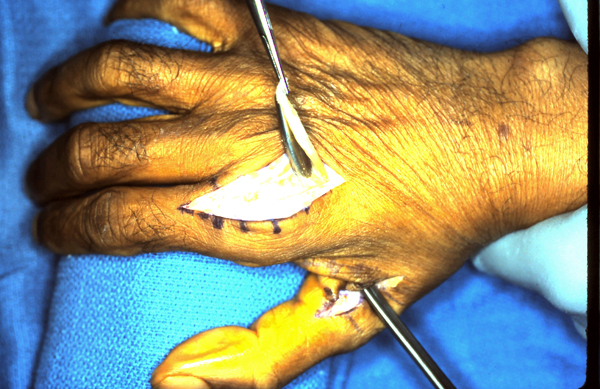 Extensor indicis proprius tendon rerouted and transfered to the thumb. 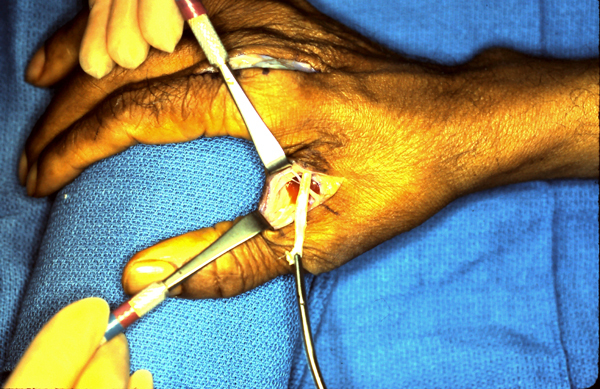 Much stronger lateral pinch obtained post-operatively. Postoperatively pinch restored. 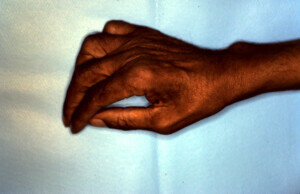 Retraining with therapy allows pinch with attempted index finger extension and becomes second nature over time.